Parliamentarians and senior public sector officials in Jamaica participated in day-two of the series of sensitization seminars on the CARICOM Results-Based Management (RBM) system, Wednesday. The session with Parliamentarians at the Houses of Parliament was addressed by Minister of Foreign Affairs and Foreign trade Kamina Johnson Smith. 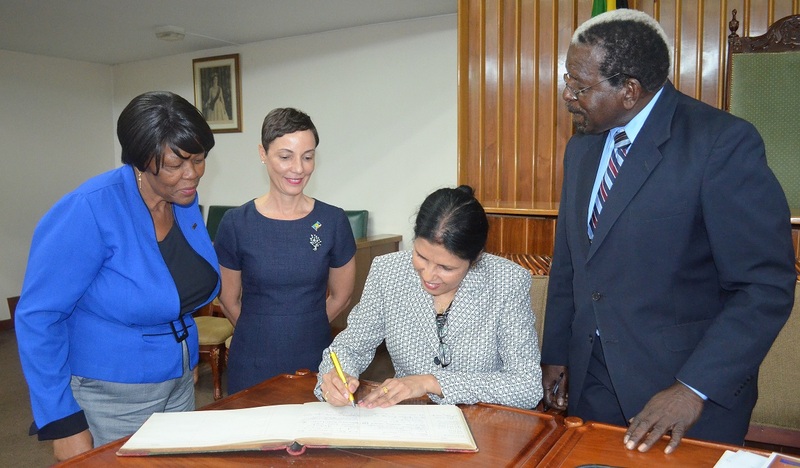 A separate engagement for Permanent Secretaries and other officials, held at the Office of the Prime Minister, was addressed by Cabinet Secretary Ambassador Douglas Saunders and Permanent Secretary in the Ministry of Foreign Affairs Ambassador Marcia Gilbert-Roberts. Other sessions will be held with representatives of the private sector, NGOs, the media and other stakeholders. The RBM sensitization seminars, being held across CARICOM Member States, are promoting a results-focused approach to programme and project management. Deputy Secretary-General Ambassador Manorma Soeknandan is leading the CARICOM Secretariat team which is conducting the seminars. The need for this results-focused approach was identified in the Strategic Plan for the Caribbean Community 2015-2019 as a corrective response to the much lamented implementation deficit in the Region. In its efforts to institute this approach, the CARICOM Secretariat, with funding from the Caribbean Development Bank (CDB), commenced the process of developing the CARICOM Results-Based Management (RBM) System. A CARICOM RBM Leadership Group was established, comprising representatives from all Regional Institutions and Member States to serve as champions and coaches in their respective entities, by promoting the adoption and utilisation of RBM and Monitoring and Reporting (M&R). In addition to improving implementation and achievement of desired results, the RBM System is expected to improve transparency and accountability at all levels among the three implementation partners, that is, Member States, Regional institutions and the CARICOM Secretariat. This will be facilitated by the Performance Measurement Framework which has been developed for each Pillar of the Strategic Plan 2015-19. The seminar series, which began in Barbados in November last year, will ensure that all stakeholders are duly sensitised about the CARICOM RBM System.